This is from Bravo's June 1970 issue, with a huge poster photo of the boys. I'll put that up later. The article is in German, so Benny, Susie, and whomever else here knows German, do your stuff! Yep, I'll have a try. I hope it's try to your satisfaction. What an interesting article, most of all the "Wanted" posters. What surprised me the most is that Bobby wore a blonde wig around 1970. I thought that it still was his natural hair. born: December 8, 1942 in Barnley/Engl. They go without too gaudy-coloured clothes and extremely long hair, they don't smash their instruments on stage and they haven't been with scandalous headlines in the news. Nevertheless, The Hollies make a positive impression on the public over and over again because of their first-class songs! The five beat-boys from England have never been as popular as they are now with BRAVO readers. They surpassed top-groups like The Rolling Stones or The Beach Boys during the last Otto election and they became the winners of the "Bronzenen Otto" (whatever that is). Allan Clarke, spokesperson of The Hollies since the departure of Graham Nash one and a half years ago, explained how the band came up with its name: "Our story started Christmas 1962. The Beatles started having success. I hang around with Graham and Tony Hicks and together we agreed upon trying out the same and founding a beat-group. We came up with the name "The Hollies" because a holly is an evergreen plant with red berries here in England which can be found in every house as a symbol of feast on Christmas Eve,"
Graham and Allan knew each other from their days in Salford when they visited the same grade in primary school. Their first vocal exercises they made together in the school's choir and a little bit later they copied The Everly Brothers as a duo. The Everlys were one of the top groups of the Rock'n'Roll era. From time to time Graham and Allan appeared on stage in night clubs as "Two Teens". They became acquainted with Tony Hicks, Bobby Elliott and Bernie Calvert there who played in a band called "Dolphins" then. Piece by piece they cut off members of the Doplphins like pieces of a salami to integrate them into their group - Tony first, then Bobby and finally Bernie. The Hollies were complete for some time. As John Lennon and Paul McCartney of The Beatles Allan, Graham and Tony became the songwriters of The Hollies. Their songs took care of the "holly" so it did not wilt and remained evergreen in the charts: "Searchin'", "Bus Stop" and "On A Carousel" - just a few of the hits penned by the trio. Their success made the shock heavier when Graham Nash turned his back on his friends after seven years, went to America and formed the new group "Crosby, Stills & Nash" together with David Crosby and Stephen Stills. For some time it seemed, as if the "holly" finally would wilt. But then the rest of the group decided to search for a successor for Graham and to continue in the same style. After they had searched for weeks they chose Terry Sylvester, one of 110 applicants for the job, who had been a member of "The Swingin' Blue Jeans" until then. 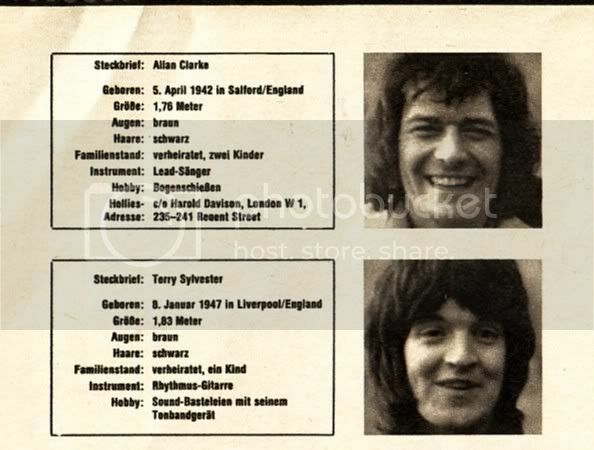 The contract with The Hollies meant a round sum of 300.000 Deutsche Mark every year for Terry. The new Hollies proved with their first hit after Graham's departure ("Sorry Suzanne") that they had found their old self-trust again, what they clearly confirmed with the following super-hit "He Ain't Heavy, He's My Brother". They even dared to record a new LP afterwards ("Hollies Sing Hollies"), that was published through their own production company. 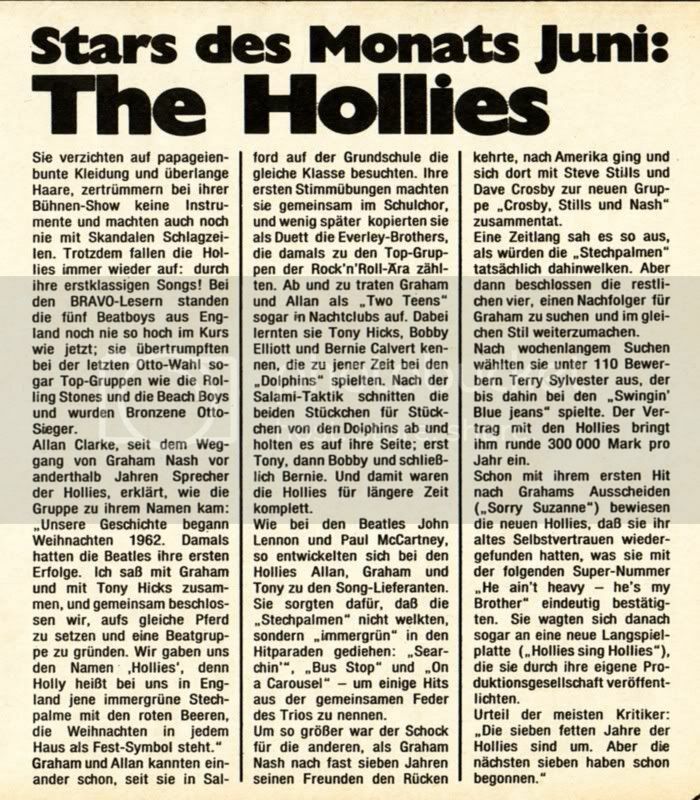 The opinion of most critics: "The seven fat years of The Hollies are over. But the following seven have already started." That's it. One last question: What about Eric Haydock ? In the article it seemed, as if Bernie came into the group around the same time as Tony and Bobby did, what definitely is not true. In spite of some mistakes it is a quite nice article. Thanks, Benny! You did a superb job. Yes, it is strange that Eric Hyadock is not mentioned. Despite the troublesome circumstances surrounding his departure, he should be given credit as a founding member of the Hollies and good bass player. Bernie is an equally good musician, but they shoud get their facts straight when they try to explain the history of the group. I assume that every photo of Bobby with long hair is the result of a wig. He had very short hair in the beginning of the group's professional career, and not long afterward began the use of his trademark hats. In retrospect it seems clear that the hats were to hide the increasing baldness. Hey, nothing wrong with that - that's the same reason that I usually wear hats, too! That seems to be true about a lot of people! I should also note: Benny, I think you omitted Allan's hair color. It's black, and his eyes are brown. Just wanted to get the details in. Thanks again for the wonderful translation! Fascinating article, thanks for the translations. The heights seem a bit on the generous side at times, I didn't think Tony was as tall as that! You're welcome, snowflake! Yes, James, the heights are far too generous. It says that Tony was 1.78 meters. That makes him 6' 1," doesn't it? I don't think he was any taller than Allan, or maybe he was an inch shorter, at least. I thought 1.78 was about 5'10"? And in my song book, Tony's height is said to be 5' 11" and Allan's 5' 10 1/2". And to continue to find faults: Tony was born in 1945 and not in 1943. Thanks, Vrinda, for posting the article, and thanks, Benny, for translating! A lot of sources list Tony's birthdate as in 1943. I thought that was the correct one, otherwise, he would have been 16 when he joined the Hollies, and I remember him saying in an interview one time that at that time, he was working as an apprentice electrician in the mills. This was in the summertime, so if he was 16, he might have just left school, so that age might fit, but I thought he was at least 18 then. And I'm pretty sure that Bernie was born in 1942. But I didn't mean to complain, I enjoyed reading the article, both in German and in English. That's okay. I knew you weren't complaining. 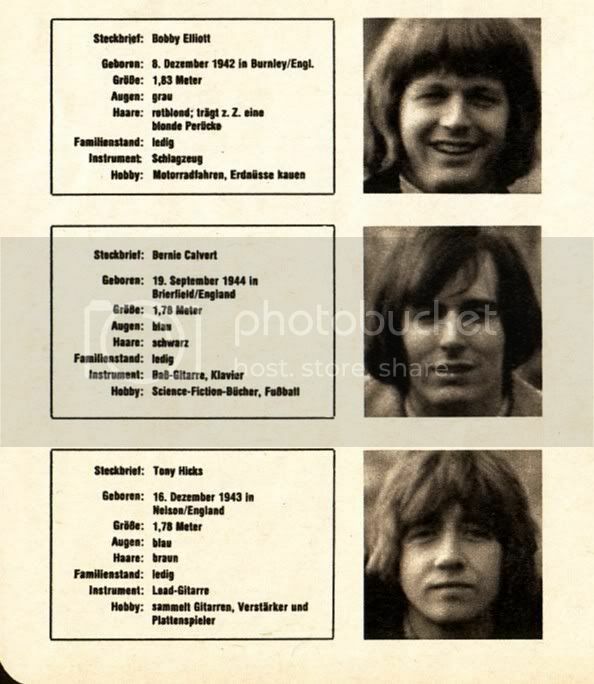 Maybe someone at one time gave Tony's birthday as 1943 so he would appear to be around the same age as his bandmates. Allan, Graham, Eric, Bernie, and Bobby were all born in 1942, and if people saw that one member was born three years later, then they would always look at him as "the youngest" and single him out because of that. I read the article and they do have some of the boys' birth years wrong. According to information, I have Allan and Graham were born in 1942, Eric and Bernie in 1943, Tony in 1944 and Terry in 1947. It is a shame that Eric never got a mention as he was in the band when they started out and Bernie replaced Eric 3 years later in 1966. Here's the photo that came with the article. I had to scan it in sections and put it together in a separate document to get it all together as one image. Sorry about the crease running through Bobby and Allan, and the line through Bernie (Snowflake!). This is a nice photo of the boys. I wonder how Terry got all the way on top!